Looking up into the columbine flower’s mouth, I see a dove with wings spread or an angel. This diminutive wild flower is found in isolated patches among the red shale cliffs that line the South Branch. Who knew, other than hummingbirds, that such a treasured crown jewel was hidden along our river. The red shale cliffs interrupt pasture and field along the South Branch to stand as an unchanging reference point, immune to progress and raging spring floods that swirl around them. The exposed cliff face is characterized by a jagged appearance, with sections of smooth rock face the exception. Ancient floods have scoured rounded contours into the soft shale, to form shallow caves, nooks, crannies and alcoves. Like a human face with striking character, the cliffs beg more than a casual glance. I cannot paddle by without desperately searching the high cliff face for ancient etchings or a petroglyph. Travelers from earliest times could not have passed up an opportunity to scribe their name or draw their hunting or fishing trophies into the smoother areas of these red shale sketchpads. It would be against human nature to leave no sign. Unexpectedly, what I have found among the craggy shale cliffs is a species of native wildflower that begins to bloom in late April through May. 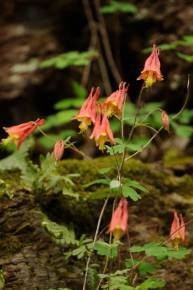 Wild columbine is not found anywhere else, except in the crevices of the prominent shale outcroppings along the river. 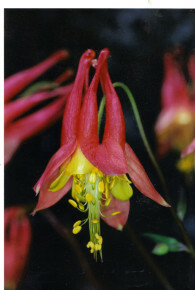 Columbine is a finely structured red and yellow flower, in the shape of a crown with five distinct tubular projections. The openings of the five separate passages are shrouded in a common vestibule. Several stalks arise from one clump, one flower to a stem, opening faces downward. The plant is not found in profusion, just in scattered, isolated patches. 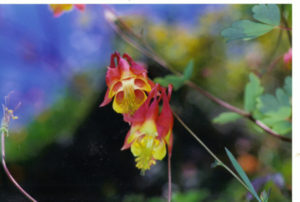 There are many commercial cultivars and species of columbine, so to be clear, the wild native columbine is Aquilegia columbine. The derivative of the name is interesting as, ‘Aquila’, is Latin for eagle, and columbine references the family designation of doves. Early taxonomists saw characteristics of both in the flower. It is said the ‘spurs’ resemble the open talons of a raptor and the face of the flower, a nest of doves. To me the spurs that project to form the crown remind me of the reversed leg joint of a grasshopper when viewed from a certain angle and looking up into the mouth of the flower, I see the form of a single dove with wings spread. The columbine flower produces tiny round black seeds in late May that are indistinguishable from poppy seeds. Though the columbine blooms about the time the first migrating hummingbirds show up, I have yet to catch a hummer dining on the flowers but surely some returning hummers have the plants marked on their GPS. How and when columbine first found anchorage in these cliffs is a mystery. In the absence of its known origins, I prefer to think of these flowers as inheritance from an ancient legacy of primitive plants. The first of which relied on wind for propagation and then, as if by the hand of an engineer, designed shape, color and form to take advantage of insect pollinators and local soil conditions. Could it be that flowers intelligently made use of the cliffs to mark their presence through the centuries where humans left no trace? 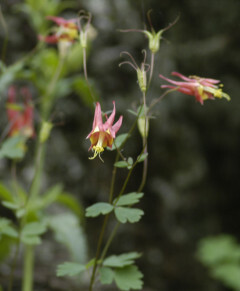 Wild columbine are the crown jewels hidden among the cliffs, that appear in the spring for a brief moment to enrich both pollinators and humans who stumble upon them.